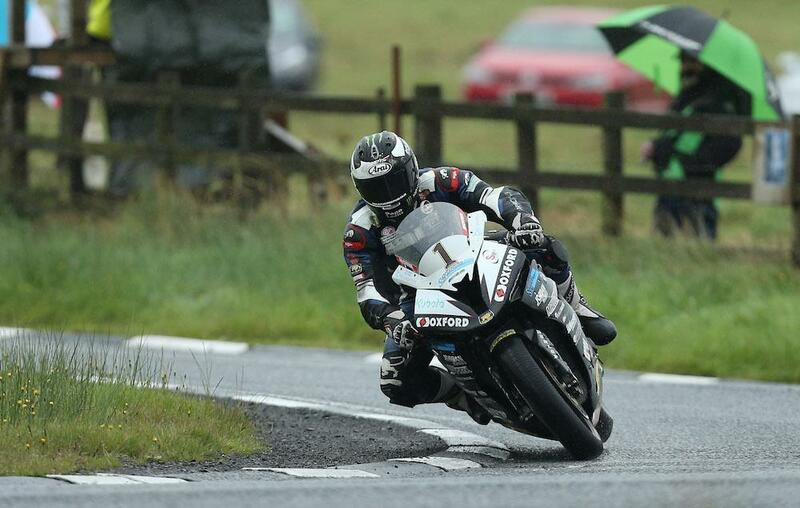 Michael Dunlop dominated a wet opening day for this year’s Ulster Grand Prix with fastest laps in the Supersport, Superstock and Superbike sessions. The only session the Ballymoney man didn’t top was the opening Superbike session for the Dundrod 150 races, in which he placed third behind Derek Sheils and Conor Cummins. Dunlop commanded the 40-minute session, with a fastest time of 121.602mph on his Hawk Racing BMW superbike and also set the second fastest time aboard his MD Racing stocker. Derek Sheils rounded off a strong opening day for Cookstown Burrows Engineering Racing in third on the Suzuki, ahead of Jamie Coward on the RC Express Racing Kawasaki. Dean Harrison was fifth fastest with William Dunlop rounding out the top six. Peter Hickman took the GBmoto Kawasaki to seventh on the timesheets ahead of Mar-Train Yamaha’s Dan Kneen, while Bruce Anstey was ninth fastest on the Padgetts RCV.